I’ll read alongside Val Griswold-Ford, John Hartness, and S.L. Wideman. 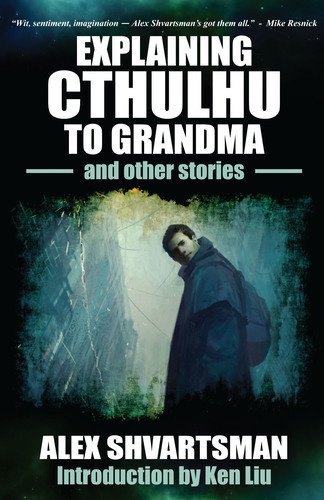 I’ll read “Dreidel of Dread: The Very Cthulhu Channukah” and maybe something else, time permitting. We’ll discuss researching short fiction markets, preparing manuscript for submission, cover letters, communication with editors, contract review and negotiation, reprint rights and markets, foreign rights, and other aspects of monetizing your short stories. Advance registration is required for this seminar and attendance is limited. Signing books with Sarah Pinsker and Michael Underwood. Lots of authors signing at the same time. What goes into being a good critiquer. How to listen to others’ critiques of your work. Where to find critique partners, online and in person. Monday, 12pm – Parlor 8029 – What’s Hot Short Fiction? If you are at BaltiCon, please say hello! How can writers reach potential readers outside of their immediate science fiction markets? A head’s up for writers on what editors don’t like to see or deal with from their authors. Headaches they’ve encountered in publishing. All about games for entertainment anywhere! A discussion about new magazine s that have come and gone, new zines that seem to have staying power, and short-lived publishing houses. Panelist discuss how writing humor differs from “straight stuff”, both in the writing process and in the submission/marketing process. A detailed discussion on every aspect of the process of creating and publishing a professional and semi-pro magazine. readers. A Round Table discussion. It seems ironic, in a time of such technical progress, and when we are confirming that the galaxy really does contain billions of planets, but a lot of science fiction seems to turn away from the future, as if, post-Singularity, it will be impossible to describe. Are alternate history and steampunk merely symptoms of a more general evasion of the future? There are many other exciting panels and events at this excellent convention. You can download the complete listing here. Feb 15-17 – Boskone – Boston – Feb 15-17 – I’m not 100% sure about this one yet, but it’s likely that I will attend on Saturday and Sunday. Mar 15-17 – LunaCon – NY – Mar 15-17 – Will attend one or more days depending on what panels/programming I get tapped for and my work schedule, but will attend for at least one day. May 24-27 – BaltiCon – Intend to attend all four days. Will participate in panels, readings, etc. Should have lots of time to hang out. I’m always eager to talk to and meet other writers and fellow SF fans, so if you see me at one of these cons don’t hesitate to say hello!